Bone Broth is the simmering of animal parts like bone ligaments, tendons & bone marrow in water over long periods. These non-edible parts of the animal are the parts that our ancestors used to make the most of the WHOLE beast that they fought so hard to find. This was also their way of honoring the animals and making sure that nothing went to waste. The simmering of these parts results in the release of compounds like gelatin, collagen, amino acids, vitamins and minerals into the water, making it a nutrient dense liquid that we call Bone Broth. Bone Broth is often confused with Stock which isn’t cooked for as long and therefore doesn’t contain the nutrients that Broth does. Stock is known for its flavour and Bone Broth for its nutrients and in my opinion the Bone Broth has a much richer flavour. Drinking Bone Broth daily can result in numerous benefits. It stimulates the release of digestive juices, aiding in digestion. The gelatin and collagen found in broth supports your immune system and also provides strong cell growth resulting in tight skin, shiny hair and strong nails. The amino acid, glycine, which is found in broth aids in better sleep and improves memory, relieves anxiety and improves your mood. This also results in the lowering of stress and therefore supports and nourishes our adrenal glands, improving our adrenal health. I have experienced first-hand the rate it relieves joint pain and inflammation as it also aids in muscle recovery. One of the benefits Bone Broth is most famous for is healing the leaky gut and all the symptoms related to intestinal inflammation and other digestive issues. It does this by enhancing the absorption of nutrients to the body. 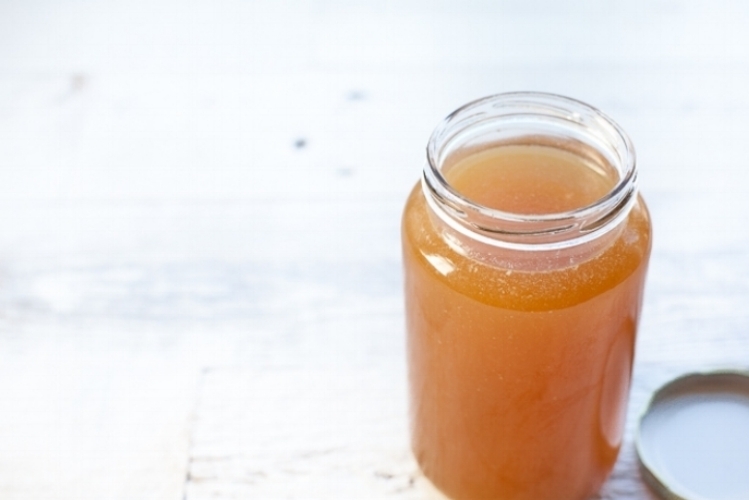 Bone Broth is also known to aid in the detoxification of chemicals and toxins from the body. Herbs, tomatoes, celery, carrot, ginger and other spices in the last few hours of cooking if you would like a beautifully flavoured broth. **Always make sure your water is filtered, you don't want contaminate this beautiful nourishing liquid with the nasties found in our water these days. Two companies I highly recommend are Zazen Water and Watersco. Place all ingredients in a slow cooker and set the heat to high. Allow the stock to cook for a minimum of 6 hours and up to 24 hours (depends on size of bones; chicken less, beef more). The longer the bones brew the better! Remember to keep topping up the water; you do not want it to go dry. Turn off slow cooker and allow to cool slightly. Strain through a mesh metal strainer and throw away the debris. Place the cooled stock into glass jars for storage in the fridge or freezer. However it only lasts a few days in fridge. Note: The gelatinous consistency means your broth is gelatin-rich! Sometimes a longer or very hot simmer may break down the gelatin and it won’t appear gelatinous, but it’s still nourishing. Heat broth and drink it warm, and at this point you can add some salt for taste. If you like, you can skim off any fat that has risen to the top and solidified. This is called tallow, don’t throw it away, use it in your savoury cooking in place of butter or coconut oil! You can drink the broth at your leisure or use it as the base for soups and stews! My slow cooker is going constantly at home, can’t get enough of this stuff! I often get phone calls from my girlfriends when they are sick as they know I’ll always have a nutrient dense jar of broth for them in my freezer. ALSO, if you are after some ideas on how to incorporate your nourishing broth in your meals check out the NEW Quirky Cooking Cookbook - Life Changing Foods.